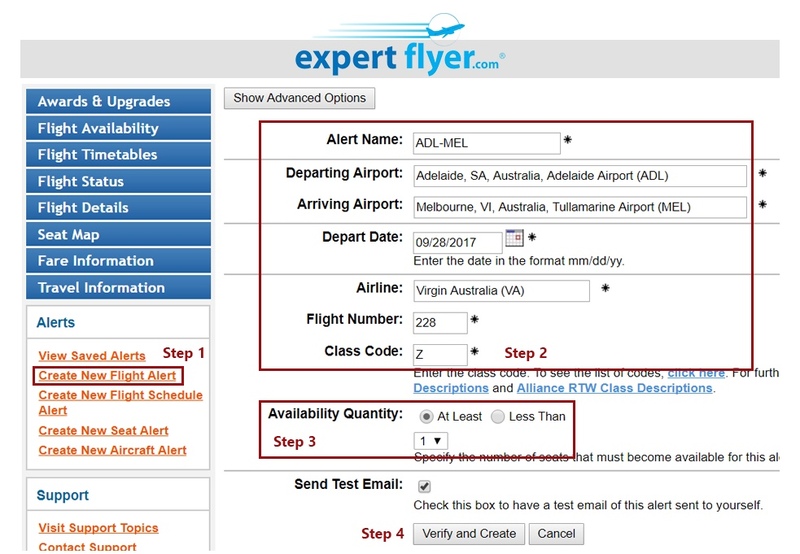 ExpertFlyer is an invaluable tool in your arsenal if you are seeking a premium reward ticket or upgrades on a flight but the availability is not there at the time of your initial search. It has the capacity to quickly search for specific upgrade/award space on flights, and if it finds none, can be set to alert you as soon as more availability is released. It kind of works the same as setting up a fare alert for if cash tickets drop below a certain price. 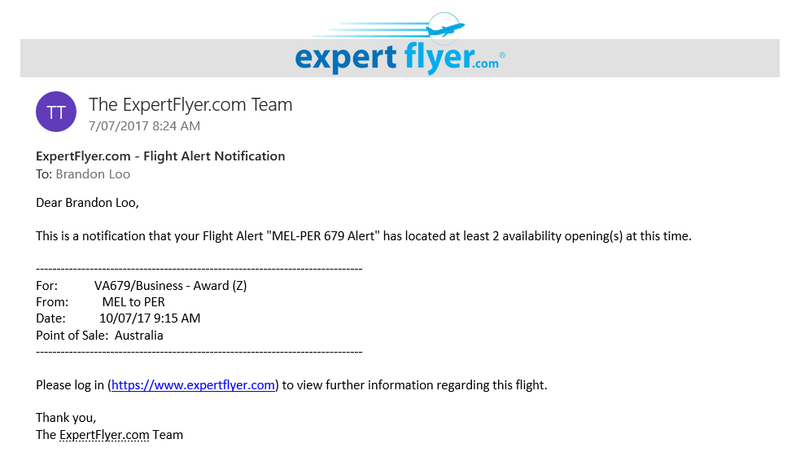 This article will cover the basics of how to use an ExpertFlyer Premium account to search and schedule award availability notifications, so you can then quickly secure the upgrade or redeem points for the reward seats before someone else comes across them. Finally, cash upgrades (usually offered to you via email) is a totally separate concept, and the advice here generally won’t be applicable. Airlines will tend to make a number of their premium seats available for points upgrade, or outright redemption with frequent flyer points. 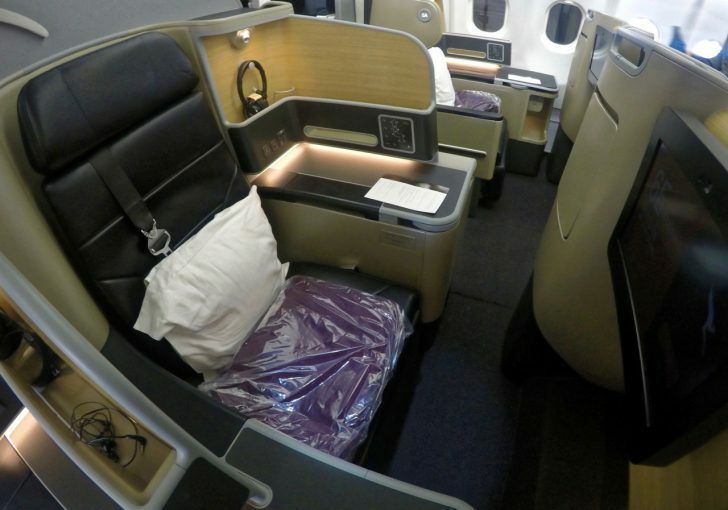 In most cases, these Business Class award seats are booked into a special fare which is different from a commercial cash fare. 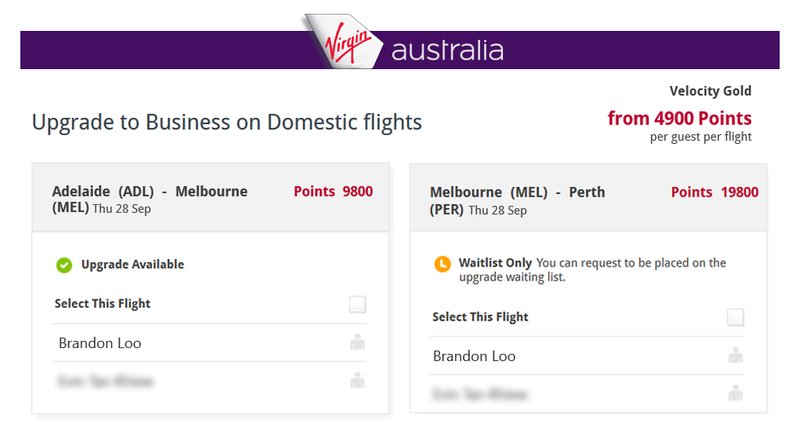 Read more in our guides to upgrades on Qantas and Virgin Australia flights. The main caveat is that these reward seats are usually very limited in number, with initially two or so seats released per flight. 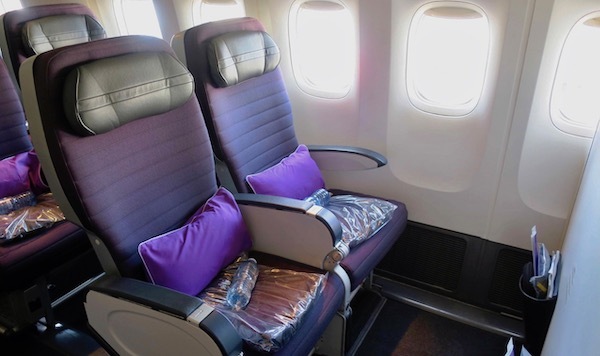 With a large number of people trying to book these seats, you’ll often find availability is scarce on popular routes like between Sydney/Melbourne/Brisbane and Perth. However, airlines tend to release some more award seats closer to the flight departure if they don’t think they will sell many more cash tickets. This is where ExpertFlyer comes in handy with notifying you when more inventory is made available. 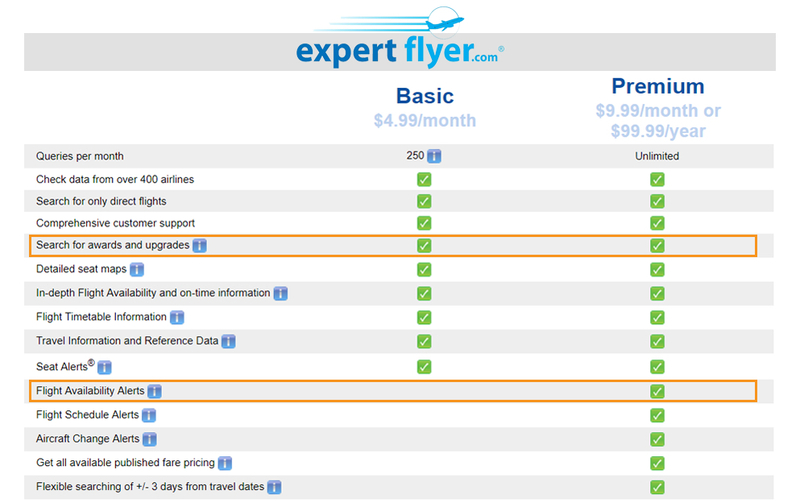 ExpertFlyer has two account options: Basic and Premium (also called Pro). While free ExpertFlyer accounts exist, they are only good for Seat Alerts, which is where you a looking for a specific seat within the cabin you’re booked in. This isn’t what we’re doing, so you’ll need a Premium account. The Basic account can search for awards and upgrades, but only Premium can generate flight availability alerts. My personal rule of thumb: if you have two or more flights within a month that you want to upgrade and they have no availability, get the Premium subscription for one month ($9.99 USD = ~$12.50 AUD) and all your flights will be covered. Activate the subscription 30 days before your final flight for best coverage. If you have just one special flight you want to upgrade, then you can sign up for their five-day free trial. By activating this five days before your flight, you’ll be covered for any last-minute availability which pops up. For redemptions, if there’s no Business reward seat availability on a flight that is a few months away, it is up to you to weigh up the cost of ExpertFlyer subscription against how much you want those seats. If it is a last-minute flight within a week, then the five-day free trial is your best fit. First, we will check if there are any reward seats available for your flight. You can do this through the airline’s website, or get ExpertFlyer to do the hard work for you. 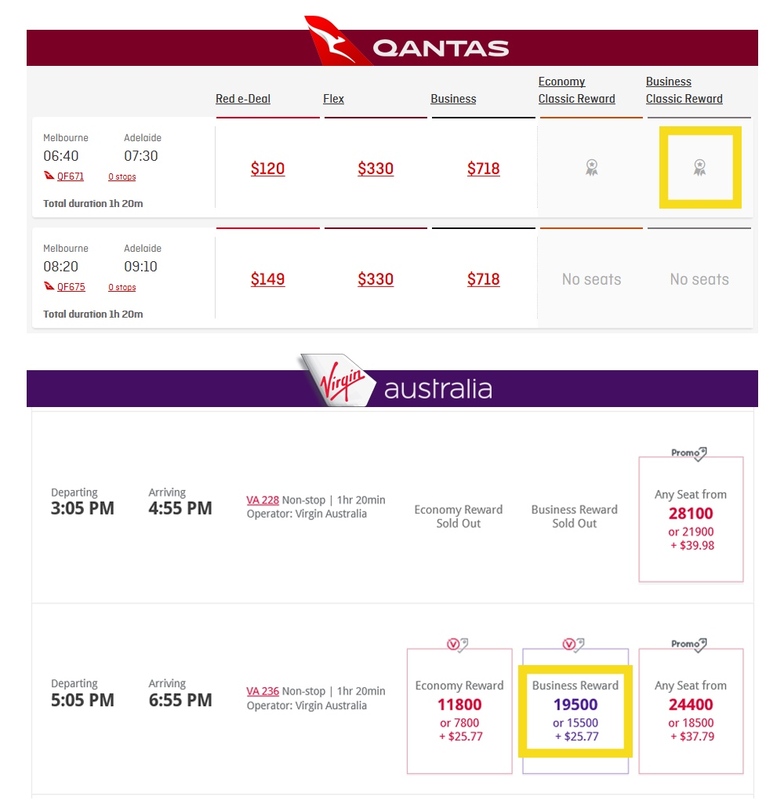 Qantas has three Business reward seats on QF 671 and one seat on QF 675; Virgin Australia does not have availability for this route on this date. If your flight doesn’t show up, then there’s no seats available – time to set an alert! Step 2: Set a name for your alert (for your own reference). Then enter all the details of the flight you want to book or upgrade. 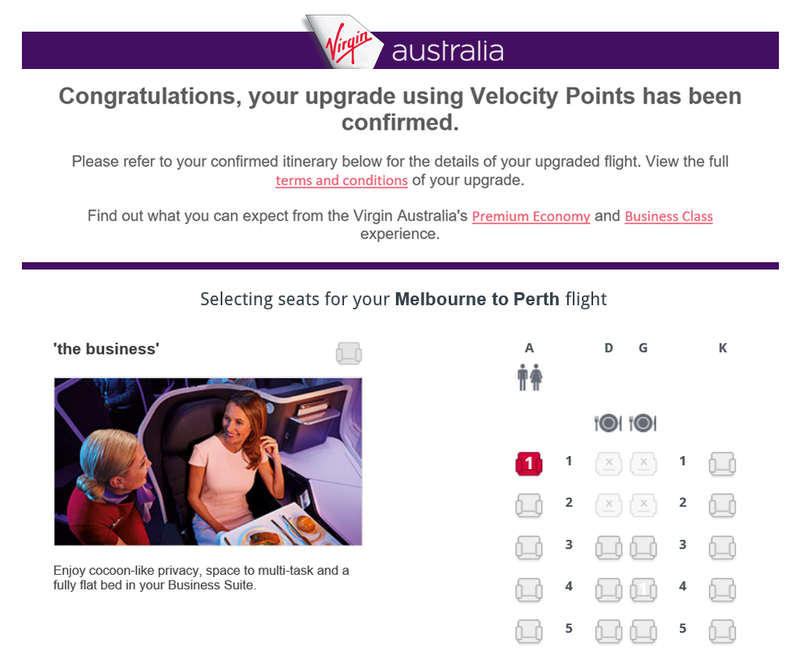 Finally, input the class code of the reward seat you’re after (Qantas Business is ‘U’, Virgin Australia Business is ‘Z’ – here is that full list again). And that’s it! Your alert will start searching automatically for the duration of your subscription. You can view it anytime under View Saved Alerts, where you can also launch an on-the-spot Quick Check in case you want it to check again manually. Chances are, someone else received it too! So get cracking and book your flights or confirm your upgrades, and enjoy your adventure! 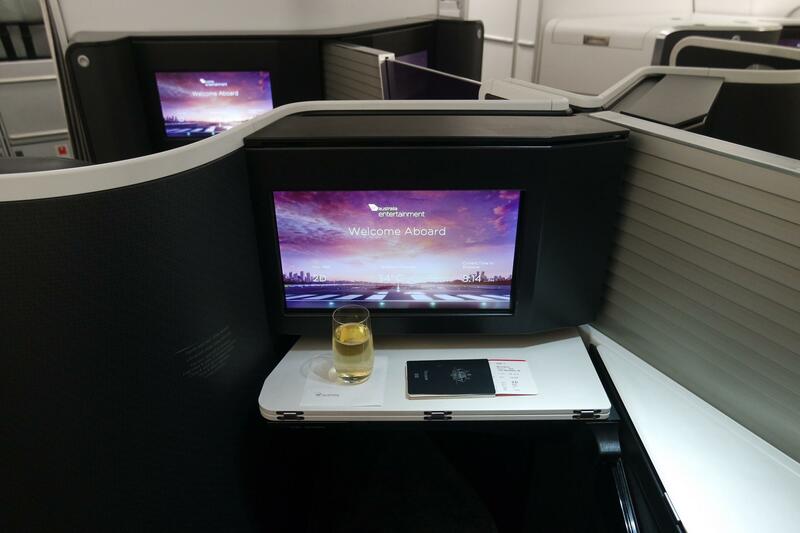 I got my upgrade to Virgin Australia’s A330 Business Class confirmed! While this guide is tailored for Qantas and Virgin Australia domestic flights, you’ll be able to set alerts for international flights and other airlines with the same steps. 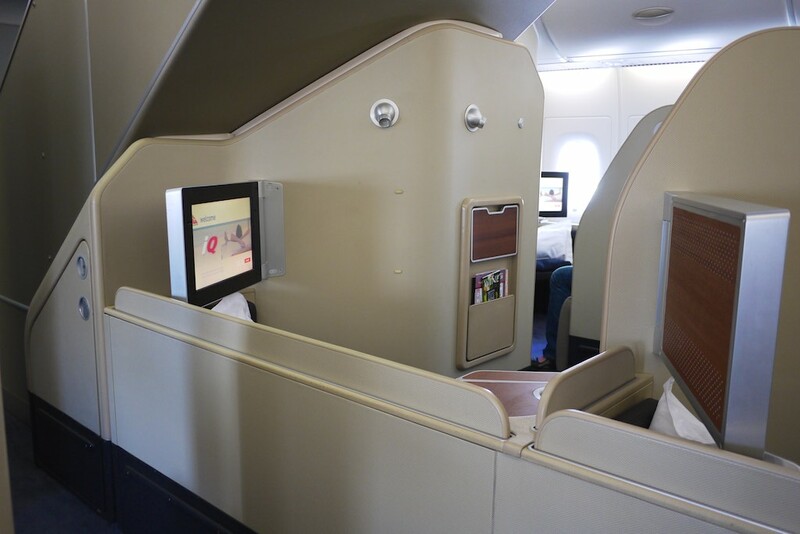 However, each airline has its own set of rules for upgrades and redemptions (especially for long-haul international flights), so make sure you do your research first. 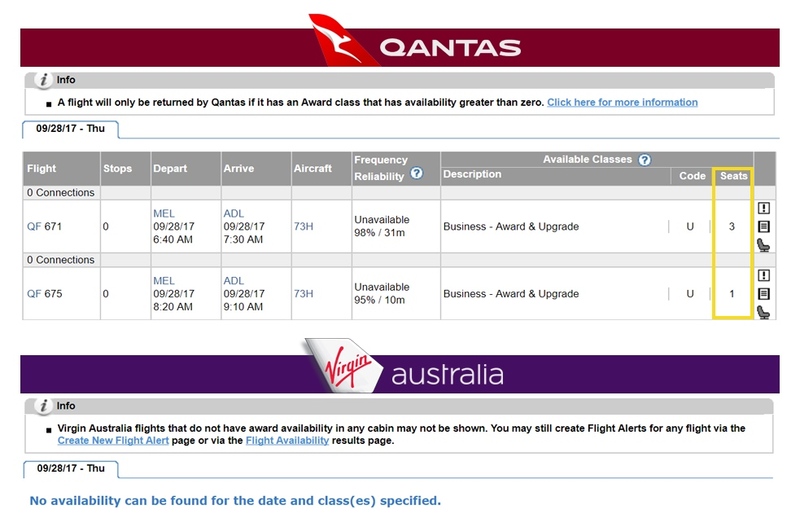 Setting an award seat alert is no good if you’re not eligible to make an upgrade in the first place! 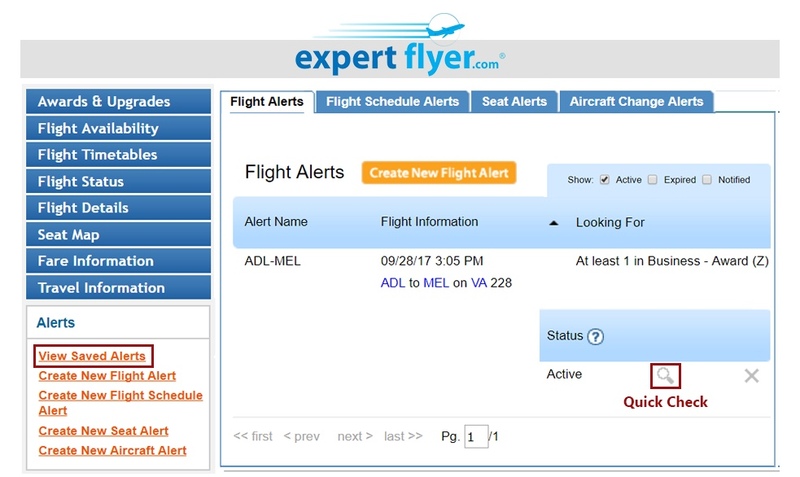 ExpertFlyer is undoubtedly useful, but it’s not for everyone. If you don’t like paying a subscription, you can just manually check your airline’s website for reward seats every day, until something comes up. Alternatively, some airlines let you waitlist through their ‘Manage My Booking’ page, so you have a chance to be considered for an upgrade a day or so before departure. But if you want a better chance at success and don’t have time to waste, this is a great tool to do the job for you in the background. It has many other interesting features which are beyond the scope of this article and could make your travels even more comfortable. We’re looking at booking some flights back from the US for Q3 this year and when I search EF, it shows plenty of J availability in the AAnytime Business Awards bucket with both connections and date flexibility and the number of seats we needed. It even shows availability on CX via SFO on the nice new A350 that CX are now flying. Ah, you’ll need to be searching both on ExpertFlyer and AA’s website for MileSAAver awards (saver) rather than AAnytime awards (standard0 to be able to book through Qantas. Whilst AA isn’t explicitly mentioned in the following guide, I’d recommend reading our guide on how to tell the difference between the cheap vs expensive redemption options. I just did a test search, SIN-SYD return, 11 AUG-12 AUG, on SQ.